Nutrition testing is offered to established clients only. Please ​schedule an initial assessment to get started! The price shown reflects the patient cost when billed to insurance. It does not include the cost of nutrition appointments. A minimum of 2 appointments are required for all tests except for MRT -- an initial assessment to review your health history and reasons for testing, and a follow up to review your test results and go over your personalized plan. Micronutrient testing is a blood test that tells us how 35 vitamins, minerals, antioxidants, amino acids and fatty acids are actually functioning in your body, not just whether or not they fall within an arbitrary "normal" range. This gives us the most accurate analysis of your body's deficiencies and allows us to correct those that may be impairing your health. 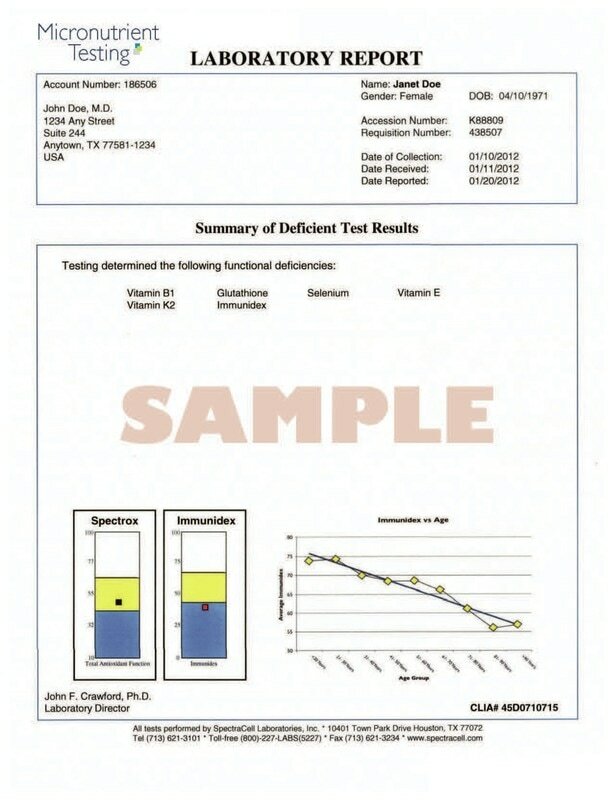 ​The test also evaluates your immune function and carbohydrate metabolism (glucose/insulin response). 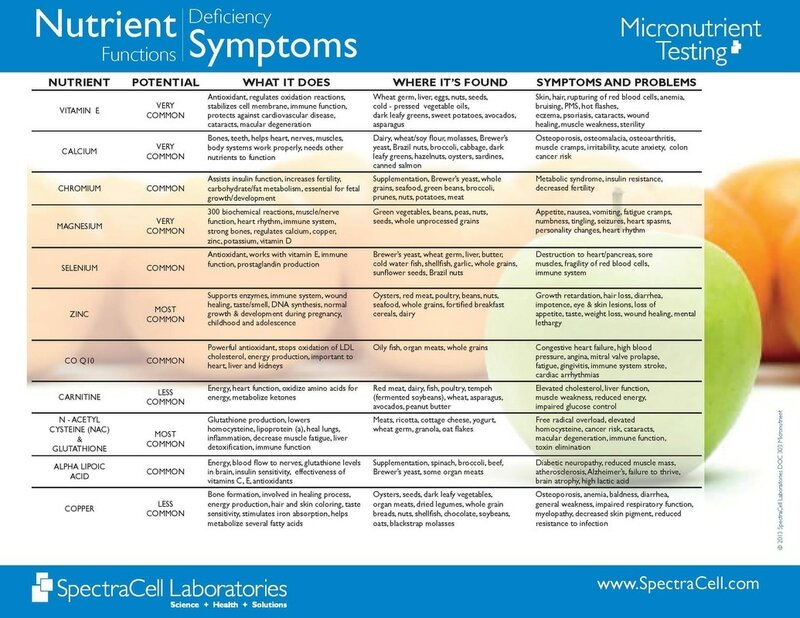 Click the links below for specific information about the role of micronutrients in the following conditions. The Mediator Release Test (MRT) is the most advanced, most clinically effective type of food sensitivity testing available. It measures your body's actual immune response to 170 different foods and food chemicals with about 95% accuracy. Based off of your results, we develop a totally customized for you LEAP eating plan to rapidly calm inflammation and allow your body to heal itself so that you can get lasting relief and get on with more important things in life. Due to the complexity of this process and the type & amount of support that is necessary to get clients excellent results, we only offer MRT+LEAP as part of our 12-week all-inclusive Cut to the Chase Food Sensitivity Program. We're excited to announce that we're now offering an exciting new service called Nutrigenomix. It is a simple genetic test using your saliva that will allow for personalized nutrition recommendations that are based on your DNA! Poor blood sugar regulation and unhealthy triglyceride and lipoprotein levels often present long before the diagnosis of type 2 Diabetes. SpectraCell's CardioMetabolic and Pre-Diabetes panels offer definitive diagnostic and clinically relevant evaluation to help define risk of cardiovascular disease and progression toward type 2 diabetes. Standard cholesterol testing only gives you part of the picture leaving many people with "normal" cholesterol numbers unaware that they are still at risk for a heart attack. Cholesterol is carried throughout the body in little balls called lipoproteins. It is the lipoproteins, not the cholesterol in them, that leads to clogging of the arteries. This test accurately measures both the density and number of lipoprotein particles (LPP), revealing potential cardiovascular problems that are often missed when only using a standard lipid panel. MTHFR (methylenetetrahydrofolate reductase) is an enzyme involved in the metabolism of folate and homocysteine. Genetic variations reduce enzymatic activity in some people and increases risk of heart disease, mental health conditions, miscarriages, neural tube defects and more. Based on MTHFR and homocysteine results, increased intake of folate alone or in combination with vitamins B6 and B12 are often recommended.